Arsenal winger Theo Walcott says he has not had a row with manager Arsene Wenger and revealed he has yet to open contract talks with the club. Walcott's current deal expires in summer 2016 and Wenger said he expects protracted talks over a new contract. 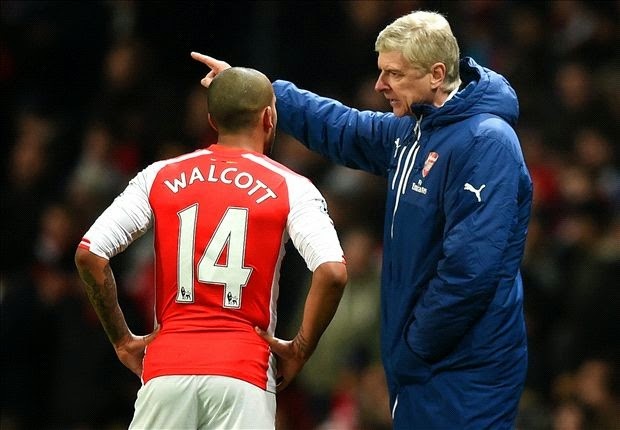 "Reports about contract demands and bust-ups with the boss are complete nonsense," said 26-year-old Walcott. "There have been no contract talks as yet and my current focus is on doing my best for Arsenal." The England international's claim that talks have yet to begin contradicts that of Wenger, who stated that Arsenal had "started very early with him" about extending his stay at the club as Walcott "is very quick on the pitch, but off the pitch not always". Walcott only signed his last Arsenal deal in January 2013, six months before he could have left on a free transfer. He has made just 13 appearances this season following his return from nearly 10 months out with a knee injury, which ruled him out of the 2014 World Cup.